Home / $JPY / BOJ / What is the BOJ Going to Do? What is the BOJ Going to Do? Under Kuroda's leadership the BOJ has surprised the market a number of times, most recently with the move to negative rates at the end of January. It is not that such a move, which has been tried by several European central banks, was without merit. After all, growth and inflation prospects are not very encouraging. The Bank of Japan's one mandate, to raise inflation pressures, has remains as elusive as ever. The BOJ has already pushed out the time that the inflation target will be reached three times. It may do so again at the conclusion of the BOJ meeting tomorrow. What made the end of January decision to adopt a negative deposit rate (from a small part of Japanese bank reserves held at the BOJ) was the misdirection by Kuroda himself. Many understood him to have said a few days before the BOJ meeting that negative rates was not under consideration. It is not clear what prompted his reversal. Some insiders suggest it was a staff recommendation, but that is not a particularly helpful explanation. It begs the question why did the majority (5-4, which means Kuroda himself was the deciding vote), accept the staff's recommendation. The shock to other policymakers rivaled the surprise for investors. The G20 meeting in Shanghai in February was important, but not for the reason the conspiracy theorists have distracted us with by suggesting a secret (which means no evidence) agreement to drive the dollar down. Not only has key participants denied the existence of a secret agreement, but there does not appear to be a compelling reason as the US dollar had peaked months prior to the Shanghai meeting. Instead, the G20 meeting, partly in response to the BOJ's surprise, raised the importance of central banks consulting each other. This does not mean permission is required, but at the highest level, it speaks to the spirit of cooperation and transparency. We suspect, but cannot prove, that the interventionists in Japan may have gotten an upper hand if it weren't for the cool response Japan received. To go against the view of its partners likely decrease the chance of success of unilateral intervention, which does not have a success. If the BOJ's adoption of negative interest rates was a surprise to markets and policymakers, the strength of the yen was shocking. It is nearly unfathomable. However, the impact on the Japanese interest rates was more than expected. The negative bond market yields (and very low long-term yields) is may be more significant that the minus 10 bp charged for a relatively small amount of bank reserves at the BOJ. The negative and otherwise low interest rates in Japan effectively frees up money for fiscal stimulus and allows Japan to minimize the new debt it mush raise. Japan's budgets have a reserve component to be used to cover a spike in rates. It appears that Prime Minister Abe will draw from these funds for a new supplemental budget that may be announced to the G7 meeting he hosts in late-May. While Japan often has supplemental budgets, they are usually in the second half of the fiscal year. Now though, with the recent earthquake, reconstruction can be part of a larger infra structure effort. Just like the Bank of Canada was influenced by the new government's fiscal plans, so too will the BOJ take aboard the fiscal stimulus that is likely forthcoming. 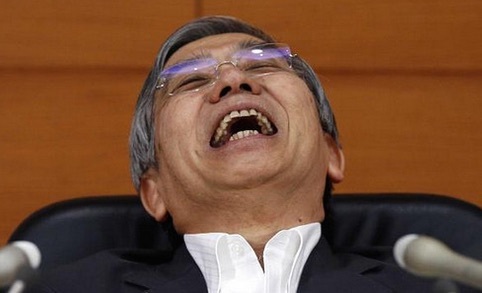 At the same time, Kuroda and the BOJ need to consider the cost of not acting. We have been arguing since April 11 that the dollar appears to be carving out a low. If the BOJ does not ease policy, the risk is renewed yen strength, a backing up of JGB yields and a sell-off in the Japanese equities. Given the recent string of economic data,including the 1.2% decline in the February all industries activity index (and downward revision in January) and the March CPI that will be reported before the end of the BOJ meeting, it is reasonable to expect the central bank will cut its economic and inflation assessments. This provides the rationale to take fresh action. Moreover, because of the G7/G20 agreement that makes intervention in the foreign exchange market difficult, monetary policy is all the more important. Market fundamentalists want to make manipulation in the currency market equivalent to manipulating interest rates. However, there is a key pragmatic difference. Manipulating currencies is a zero sum exercise. Manipulating interest rates is not. Many international officials, including some Americans, caution against over-reliance on monetary policy. This speak to the need of structural reforms. Indeed, the dire straits that Japan finds itself in, is forcing some policymakers to think outside the box. For example, rather than hike the sales tax on consumption, which was not particularly strong in the first place, we argued in favor of a tax on retained earnings (above some company average). If Japanese companies are sitting with near records of cash on their balance sheets, they can be told to use the money e.g(invest, acquire, boost wages, dividends, stock buyback programs), the government will do it for them. At the time, some officials we spoke with scoffed at this, but now we see that others talking about this possibility and it appears to be getting a second look from at least a few officials. What can the BOJ do? There seems as if there are a fixed number of possibilities for what the BOJ calls Qualitative and Quantitative Easing with Negative Rates. In terms of quantitative easing, it can increase the assets it is buying from the current target of JPY80 trillion a year. If the government is considering a new long-dated bond issue, to fund recovery and reconstruction, it is yet another instrument the central bank can buy. The qualitative part of the easing refers to the type of assets being bought. In addition to JGBS, the BOJ could widen out the kinds of bonds it buys and it can buy more ETFs, for example, The BOJ can cut its deposit rate deeper into negative territory. It can increase the fraction of reserves at the BOJ that are assigned a negative interest rate. There has also been some suggestion that the BOJ can offer negative interest rate loans, as the ECB will under certain conditions. In summary there are two big unknowns. What will the BOJ do and how will the markets respond? Given the BOJ's penchant for surprising the market and the counter-intuitive market response, one cannot have much confidence in the answer to either question. At the end of January the BOJ surprised the market in easing policy and the yen rallied. Now, at the end of April, it is unlikely to be able to surprise the market in the same way, as investors are aware of a greater range of scenarios than they were in January. We do not think that the outcome of the FOMC meeting plays much of a factor in the BOJ's decision. They know what many in the market understand. A rate hike by the Fed is highly unlikely, and move in June is possible but far from a done deal. The price action should be respected. The JPY112.00 area is the proximate cap. A move above there could see JPY114.00. On the downside, we see initial support in the JPY110.25 area, and then the pre-weekend low near JPY109.40. A break of this lower level would warn of the risk of a return to the lows (~JPY107.70). There are equity implications as well. If the BOJ does not increase the ETF purchases, or in other ways disappoint expectations, the first target for the Nikkei (closed at 17290 today) would be the high from April 20 (bottom of a gap) at 17099, but a move that corrects the advance from April 18 (~16254) could bring the Nikkei toward 16773. Japan's 10-year government bond yield bottomed near minus 14 bp on April 20. Today is near minus five basis points. Japan 9-year inflation-linked security outstanding. The low point was reached in mid-February near 11 bp. Today it is near 42 bp, the highest since early February. This would imply that real (inflation adjusted) rates are deeply in negative territory. Foreign investors have been net buyers of Japanese bonds this year (JPY2.8 trillion or ~$25 bln). They were net sellers for three of the four reporting weeks last month,but have been net buyers in the three reporting weeks here in April. Over the past seven weeks, taken a whole, foreign investors have been small net buyers.